So trying to clean up from all my repairs...climbing in and out of the bielge things got a bit messy. 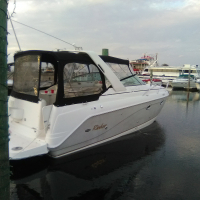 Regular boat soap does not make a dent and concerned to use acetone to get it....is that safe for the gelcoat? It should be fine as long as you wipe off with something else afterwards. Castrol Super Clean. Good stuff. For smooth surfaces use wax with clearer.